Many people looking to break into the medical profession are choosing to train for a career in radiological technology. To most people, a radiological technologist is known simply as an x ray tech. No matter what you call it, it’s a rewarding profession in a growing field that is expected to add a lot of jobs through 2020. Those who successfully complete their training and certification can expect work to be plentiful, making this field a great option, particularly for those who are being forced to switch careers amid a sluggish economy. Those looking to enroll in an educational program will want to be prepared and a bit of research is necessary to ensure you are choosing the right school. Here are five things you’ll want to know about x ray technician schools. Most entry-level techs earned an Associate of Applied Science degree (A.A.S.) from an accredited institution. This degree typically takes two years to complete and is offered at colleges and vocational schools throughout the country. The goal of this degree program is to prepare students to enter the field successfully. This means not only developing the skills needed to perform the essential duties, but to pass any exams needed to acquire certification. Certification requirements vary from state-to-state. 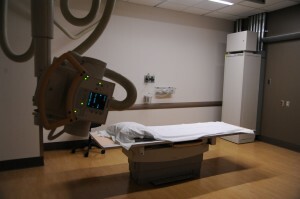 Some x ray professionals choose to go back to school and pursue a bachelor’s degree. This is typically an additional two years of schooling, but will lead to a higher salary and the potential to advance in your career. A high school diploma or GED are usually enough to gain acceptance into one of many accredited x ray technician schools. However, those with a good grasp of math and science will have a much easier time applying the concepts. The first months of a x ray technologist’s schooling will often involve biology, science, math and anatomy. If you have been out of school for a while it would not hurt to study up on math and science. Students will want to enroll in x ray technician schools that can work with their schedules. For instance, someone with a full-time day job will want to look for a program that offers night classes as well as a few online courses. A student who’s fresh out of high school and does not have a full time job will have a much easier time attending classes during the day. No matter what time you choose to attend classes, it’s important to black out plenty of time for studying. Pick a place free of distractions where you can spend a couple hours every day studying. Funding is an important, and often overlooked, aspect of searching for x ray technician schools. Many colleges offer grant and scholarship programs that could help you fund your education. The rest of the money typically comes out-of-pocket or through student loans. If you can get a government-backed student loan with a low interest rate, that’s the best way to go. If that’s not an option, shop around for the best rate and terms. Never borrow more than you need. This will lead to hard-to-manage payments when you graduate and start looking for a career. This is an important department in any college or vocational school. Choosing a school with job placement and career services will help ensure you have a leg up when it’s time to nail down a new career. Professionals in the career services department will help students put together an effective resume and provide leads when job openings become available. Plenty of colleges work directly with hospitals to place graduates into a career.